"I have had a number of Point Park students for internships. I like to throw my interns into the fire and give them real tasks and responsibilities to handle on their own. Mitchum has been tremendous at this. He has taken charge and handled a number of tasks at once. I am happy he is taking advantage of this opportunity. It will be an asset for him as he continues to develop and grow. Mitchum has all the tools to succeed and it’s fun to watch a young talent like him grow." "As soon as I toured the Point Park University campus and learned about the sports, arts and entertainment management major and its hands-on approach to the industry — I was sold. Because of its Downtown Pittsburgh location, Point Park has much to offer with its proximity to professional and collegiate sports teams, theatres and the Cultural District, concerts, restaurants, various businesses and large corporations." 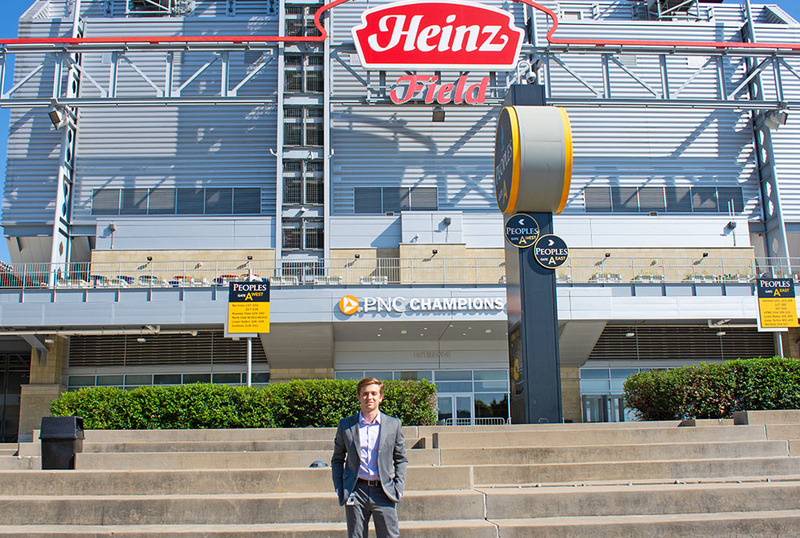 How did you land a summer internship with Heinz Field? After attending the Sports Industry Networking & Career (SINC) Conference in Washington D.C. this past spring, I was looking into a few different internships with professional sports teams. The SINC Conference was a great opportunity for me to hone my interview skills, practice my “elevator speech” and network within the industry. When I got back from the trip, I applied for a summer marketing internship with the Pittsburgh Steelers, but since that was not available, my resume was passed along to the Entertainment Operations Department. After my interview, I was offered the position. Tell us about the type of work you are doing for this internship. To use a popular expression, I’m “wearing many different hats” while working for Heinz Field. Primarily, my job consists of the planning and execution of activation events for our corporate sponsors. The Pittsburgh Steelers and Heinz Field are well-respected organizations with many equally respected sponsors. As an intern, I reach out to sponsors and ask them what they want to get out of their on-site activation displays during concerts or other stadium events. With their assistance, I plan out the best ways to run their events and displays to maximize efficiency and satisfaction for both sponsors and patrons. An additional primary function of my internship involves assisting in the planning and execution of meet and greets for various artists during their concerts. I chose Point Park because of the opportunities the SAEM program offered. The majority of the SAEM professors have careers in the industry and offer valuable insights into the business. I looked at a few other schools, primarily for business, but I was also interested in sports management. As soon as I toured the Point Park University campus and learned about the sports, arts and entertainment management major and its hands-on approach to the industry — I was sold. Because of its Downtown Pittsburgh location, Point Park has much to offer with its proximity to professional and collegiate sports teams, theatres and the Cultural District, concerts, restaurants, various businesses and large corporations. How have your SAEM classes prepared you for this internship? My SAEM classes have given me informed and realistic expectations into the real-world workplace. All of the assignments are relevant — the faculty teach you how to create a project or compose a report in a professional and timely manner. Professor Teresa Gregory’s Event Management class had me working on assignments very similar to what I’m doing now for my internship. All of my professors have boundless knowledge and it’s easy to see that they truly care about their students' success. From Paige Beal’s Marketing and Promotions class to Robert Derda’s Managing a Sports Organization course to David Rowell’s Career Prep class, I’ve been able to acquire many of the skills necessary to succeed in a hyper-competitive world. My generation changes career paths more than any other prior generations so I like to keep as many doors open for myself as possible. Ideally, I hope to work in the sports or entertainment industry in some capacity. I want to gain as much experience as I can in various areas so I can be a valuable asset in whichever path I choose. Point Park University offers many different types of internship opportunities so start inquiring about them early. The early bird gets the worm. Get involved with all you can during your time at college — be it clubs, school functions, sports or just spending time with your friends.